Bourmad had been a chartered surveyor and Whitter a property marketer for 15 years when they came up with the idea for Blaze during a night out with a client. There were already a few big hitters on the property marketing scene, such as 90 Degrees (who Whitter previously worked for) and Richard Barber, but Bourmad and Whitter thought they could bring something new. "Being an agent, I knew their weaknesses," says Bourmad, "and I knew we could open up a few more doors to contacts and provide a better service." Blaze primarily act for landlords, property agents and developers, helping their clients to promote new schemes or developments through a full range of traditional and digital marketing solutions. Bourmad says Blaze's difference comes in its "speed, professionalism and cost", but he claims the thing that really sets them apart is their experience on the other side of the fence. Clients include Savills, DTZ, GVA and Peel Group. 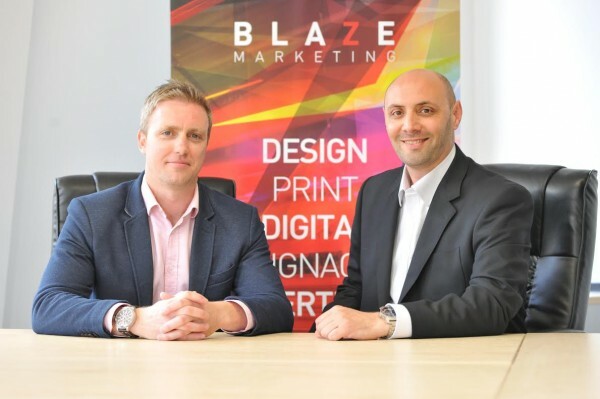 Blaze has just taken on its first member of staff, a graphic designer, and Bourmad says the company has no debt and recorded a profit in its first trading year. But he insists they're not going for "drastic growth". "We want to grow organically to ensure service levels are maintained, and return work is paramount for us. But we're absolutely delighted with what we have achieved so far in terms of pitching - and winning - against major competitors."